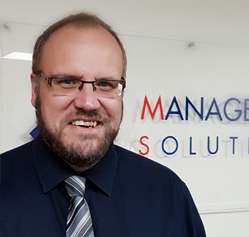 Andrew joined Managed Risk Solutions in 2015 years. Prior to this, he had worked for Allianz Insurance for over 25 years. His role at the company is to provide support to the Directors in the form of an office based role to deal with customers immediate requirements plus the day to day correspondence, emails and phone calls in respect of mid-term adjustments, renewals and claims. In his spare time he likes to spend time volunteering at Sywell Country Park helping with the conservation work.